Using clay is very easy, but you must follow the instructions. Use clay incorrectly and you will create a mess or scuff the surface of your paint. Before using detailing clay, you must thoroughly clean and dry your car to remove any loose dirt. Direct sunlight should not fall on your car's surface, and it's best if the work area is relatively cool to prevent rapid evaporation of the clay lubricant. To use the clay bar, you spray a lubricant on a small area of your car and rub the clay back and forth with light to medium pressure. If the lubricant begins to dry, you'll need to spray more. Clay is fairly sticky and cannot be used dry. Try using clay dry and you'll make a big mess and scuff your paint. After a few passes with the clay, rub your hand over the area you cleaned to check for areas missed. You should feel a distinct difference between the areas you have clayed and the areas you have not clayed. Keep rubbing until all contamination bumps are gone. Finally, wipe the clay residue off with a soft microfiber towel, and buff to a nice luster. Just like waxing, work in small areas. Check the clay bar frequently for hard particles. When found, pick them off. 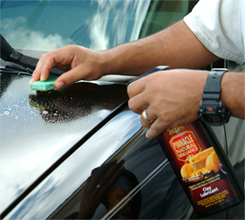 Make it a habit to occasionally knead and reform the bar so that a fresh portion of the bar contacts your car's paint. If you drop your bar of clay on the ground, it's history. Toss it out. Don't take any chances, discard the clay bar if it becomes impregnated with grit. 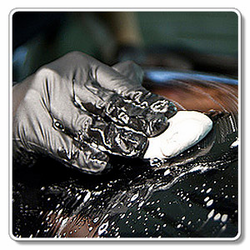 Read the manufacturers' directions for the number of uses of their clay bar. Do not overuse a clay bar. When you're finished claying your car, you should wash it to remove the lubricant film, then go over it with a pre-wax cleaner to finish cleaning the paint. Finally, seal your freshly cleaned paint with your choice of wax or sealant. Be sure to use plenty of clay lubricant.Pinnacle Clay Lubricant is a premium clay lubricant formulated with high-quality ingredients. One of the benefits of Pinnacle Clay Lubricant is that it will not strip wax protection or cause streaking. After claying one or two body panels, your clay will begin to look dirty. Don't be alarmed, that's just the clay doing its job. Flip the clay over and use the other side. When both sides are dirty, remold the clay into a ball and flatten to reveal a clean surface. Clay isn't just for paint. You can use detailing clay on any smooth, hard surface, including glass and chrome. Do not use clay on clear plastic, such as headlight lenses. When I can no longer remold clay to get a clean surface, I retire it for use on my windows. The dirty clay will not harm glass, and it's amazing how much dirt film clay can remove from your exterior glass. I also use my old clay to clean wheels. Clay will safely remove stubborn, embedded brake dust, tar and road film from all factory wheels. Clay is not recommended on wheels that do not have a factory clearcoat or powder coat finish. With just a little effort, stubborn brake dust that even the strongest cleaners won't remove comes off with detailing clay.